On the manufacturing side, Continental Jewellery (Mfg) Limited, the Group's wholly-owned subsidiary, mainly engages in the product development, manufacture and marketing of fine jewellery primarily for export and is regarded as one of the leaders in fine jewellery manufacturing. A substantial share of our jewellery products is directed at the middle to upper segments of the market.Continental Jewellery (Mfg) Limited specializes in manufacturing fine jewellery in precious metal set with diamond, ruby, emerald, sapphire, peart and other semi precious stones. The Group has production plants in Hong Kong and China. ● A well developed hand-set team in Jewellery manufacturing facilities. ● A strong in-house design team using CAD/CAM systems. ● A well skilled in-house micro-setting team. ● A strong production unit using CNC machines. ● Separated production line to produce high end and larbour-intensive pieces. ● Equipped with over 50 sets of micro-setting machine with 40X magnification. ● Specialized quality control inspection applies to every process in the production line. ● Separate training and system installed. ● Certified with ISO 9000 since 2005. 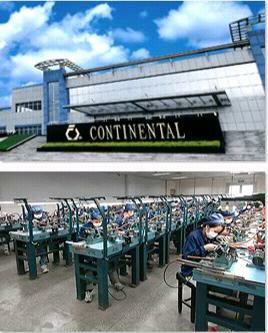 Hong Kong Continental Jewellery (Mfg) Ltd.
China Continental Jewellery (Jiangmen) Co.Ltd. China General Jewellery (shanghai) Co.Ltd.